Mevagissey- boats bobbing in the harbour. Old Mevagissey-For hundreds of years the village was, like so many other Cornish villages, dependent upon the sea and fishing. Particularly for often huge catches of pilchards- caught by seine nets and for catches of mackerel caught by drift netting. Each drift net would be up to 120 fathoms long, up to 12 nets would be joined together to create the drift. Even as late as the 1930's the Cornish lugger with its distinctive dark brown sails was a familiar scene. Once the laden boats returned to harbour the pilchards would be put into wicker baskets and hoisted ashore. The fish would then be taken to the fish cellars, where they would be 'baulked' for up to a month in salt before being pressed to release the oil, commonly used in lamps for lighting at the time. Did you know that a hogshead barrel would hold 2000- 3000 fish, and once pressed yield 8 or 9 gallons of oil ? Originally the cellars were in the fishermens' cottages but later purpose cellars were built. At one time there was also a fish cannery, numerous boat builders and net makers in the village.. Nowadays fishing is by trawling, crabbing, netting and feathering for mackerel. Don't attempt to drive down to Mevagissey Harbour, instead walk down through the narrow twisting streets. Can you find the quaintly named Shilly Alley Ope or as many guidebooks incorrectly call it Shilly Shally Alley ? Lots of opportunity to window shop on the way. From bookshops to galleries to gift, craft or fishing tackle shops. Stroll out to Outer Harbour where the working boats moor. Sit in a sunny spot and take it all in. Visit the Aquarium - once the Lifeboat House. Have a drink in the Ship or Fountain. Enjoy a meal in the Sharksfin Bar and Restaurant or the Harbour Tavern, both overlooking the working harbour. 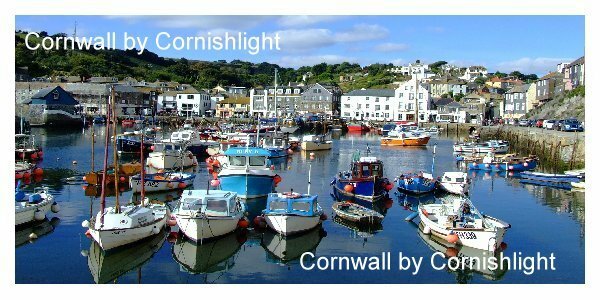 Why not Order a Cornwall Tourist Guide? Explore the delightful Museum , housed in an old boathouse, with fascinating exhibits and photographs . There are a wide choice of places to eat, from delicious fish and chips to sit down meals in graded a la carte restaurants, to genuine olde worlde inns, such as the Fountain dating from the XVth century. How about this mouth watering selection from the Wheel House restaurant: Cornish Seabass and black bream fillet; plaice and brill fillets; or a Cornish Seafood medley- Fowey River mussels, St Austell Bay scallops, and calamari cooked in garlic butter and red wine? Delicious. In Season take the passenger ferry across St Austell Bay to Fowey. Much of the South Cornish Coast is in the hands of the National Trust. On a clear day Dodman Point has great views across Falmouth Bay . Closer to the harbour for the energetic, the Coast Path offers wonderful coastal vistas for the keen walker. West around the Cornish CoastPortmellon to Dodman Point, where some of the house have wooden shutters over the windows to keep out the winter gales, along to Portloe, with the crabbers on the slipway. Nare Head with views across Veryan Bay to back to the Dodman. Beaches Nearby is Gorran Haven , yet another unspoilt south facing village with a harbour, it has a small sandy beach when the tide is out. A real suntrap .Also nearby, reached down narrow lanes is lonely and quiet Hemmick Beach. For the family Porthluney Beach has plenty of parking and the bonus of beautiful Caerhays Castle as a backdrop. To the west is Pentewan, once a bustling harbour, with its own lock gates. Why not take your cycle for a ride along the Pentewan Trail? Mevagissey Cornwall.